"I'm..." She stops and recalls Babylon 5. "...a writer." The Inquisitor nods. "You have passed." I'm a writer. But you already know that much - so let's fill in the details. The world is full of great, breathtaking stories, and I have a unique opportunity to bring you some of those you wouldn't be able to read otherwise, unless you speak Czech. I've lived in Prague my whole life and Czech is my native language. It's also the language that gave us the word "robot". Czech science fiction and fantasy doesn't end with Karel Čapek or Josef Nesvadba. It's been thriving for countless decades and still produces beautiful, mindbending works. If you need proof, check out Hanuš Seiner's short story "Terra Nullius" in Strange Horizons and novelette "Hexagrammaton" at Tor.com. I translated both of them, and luckily there's more where they came from. Seiner often reminds me of Greg Egan and Ted Chiang, but it would be too easy to stop at that. Each writer is unique. 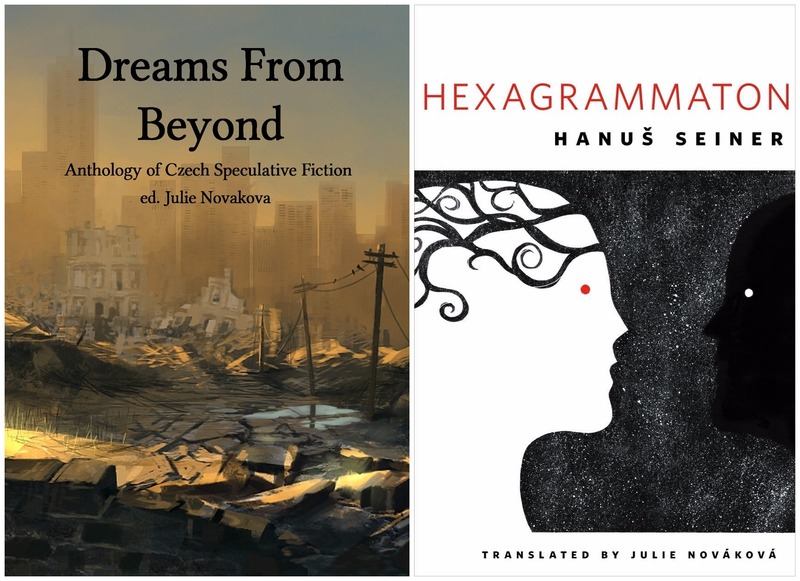 So I encourage you to listen to more voices - like in my anthology Dreams From Beyond, which takes you into the fantastical worlds of ten Czech SF and fantasy authors (translated by several different translators). Read its reviews at SF in Translation, Strange Horizons, and The Future Fire. Should we stop there? Nah. I know stories that would keep you awake at night with a book under your blanket, that would blow your mind or brighten your day. But if you're not a Czech speaker, someone has to translate them first (in this case into English). I guess that would be me. But translation is demanding and time-consuming, which makes it hard if you don't have a certainty that the piece will be published at professional rates. Unless it is, I have spent a lot of time doing something that just doesn't pay, although it has value. Some editors are willing to look at translation pitches or samples (which take time to prepare too), however, for most venues, having a full translated story is best, though it's extremely risky time/money-wise for the translator. I hope that you'll help me overcome that and come up with more great translations! "But I want..." Yes: What do you get? Each month, I'll share several patron-only posts for all supporters - let's call it "glimpses of the life of a writer", with all the tooth and claw that comes with that! They will include writing and publishing tips, minireviews and thoughts on what I've read or seen recently, and some extra content (look below at What's more? ), and access to an overview of how much I wrote each day of the month. All backers pledging 5$ or more will also receive a large chunk of my writing or translation in progress, available both online and as a pdf download. Top subscribers will be also eligible for one short story critique per month (see Rewards). However, the amount of these rewards is limited, since my time is too (unless someone lends me a TARDIS and throws in a couple of regenerations). All of you also get my sincere big thanks. Your support, in terms of both pure enthusiasm and finance, is showing me that I should keep doing my work and making your lives better in turn. Writing, translating, PhD study, science writing - the things I principally do - aren't exactly bill-paying jobs. I'm doing all these things because I love them and I'm damn good at them, but it would be nice to have an additional small income I could rely on. It would free my hands to do more exciting creative work and worry less. I'm a full-time PhD student of evolutionary biology at the Charles University in Prague, where I study evolution of behavioral traits such as altruistic and cooperative behavior. Apart from that, writing and translating fiction, I'm becoming more and more engaged in astrobiology education and outreach, and in science writing. I've attended the European Planetary Science Congress in 2015, The Astrophysics of Planetary Habitability and the International Astronautical Congress in 2016, and a yearly meeting of the Stockholm University Astrobiology Centre in 2017. I'm also looking forward to several more events this year! You can find my conference reports on my blog. In addition, I have interviewed ESA's director Jan Wörner, NASA's astronaut Leroy Chiao, DLR scientist Hauke Hussmann and other amazing people in science and tech. If you were at last year's Eurocon, you could have seen my popular science talk about Venus' history. For this Eurocon, I've got a talk about icy moons (who doesn't love Europa? ), and I'll tell you something new, something old, something borrowed from many scientific papers and something blue (did anyone say methane?) about exoplanets at Worldcon in Helsinki this August. By supporting me, you'll also receive science-related updates, be it peeks into the life of a PhD student (think PhD Comics, but with less free food), snippets from my work at the university or upcoming popular science talks, sometimes short commentaries of scientific news, videos, or drafts and excerpts from my popular science articles. You never know when that comes in handy! An approx. 1,000-word snippet from my own story or translation each month. You'll be the very first people seeing it! At least one drawing each month! Hang out with an author! You're supporting my monthly internet connection, which is essential for all my work - sending out works to editors, researching stuff for both stories and science, communication with you... You're thereby freeing my hands a bit to do more amazing work. Thank you!